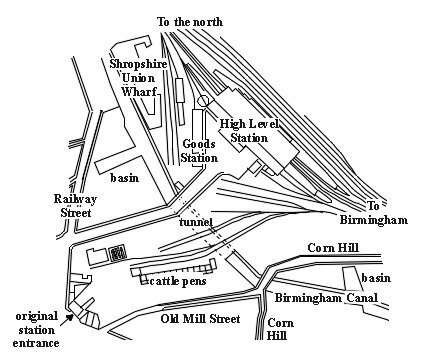 The Shrewsbury & Birmingham Railway purchased the site on 29th September 1847. The site originally consisted of small industrial buildings, houses, and a part of the canal. The building was designed by Edward Banks who was architect for the railway company, the tender for construction was placed on 9th March 1849. The High Level Station in the early 1960's just before demolition. It was re-built as part of the electrification scheme. The initial buildings consisted of the main station itself and a grand entrance building situated at the end of a 220yard long drive at Five Ways. It had four arches, the centre two were for carriages, and the outer two for pedestrians. Above the entrance were the offices and boardroom for the railway company, and at each side was a row of shops. The building opened on 10th October 1849. Work on the station was delayed because a decision was made to divert the canal, and it finally opened on 24th June 1852, but even then work on the refreshment room hadn't started. 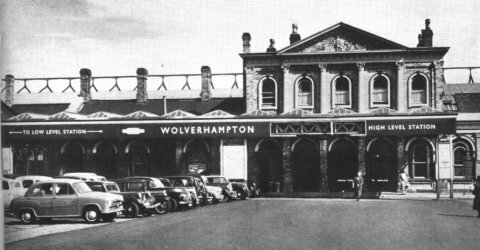 It was a handsome white brick building, originally known as Wolverhampton General station, but renamed Queen Street station in September 1853, because the entrance building faced Queen Street. known as the Low Level. Queen Street Station was officially renamed High Level Station on 1st June 1885. March 1859 when the Great Western sold its half share in the station buildings to the London & North Western Railway who owned the other half. The Midland Railway also began to use the station from 1st September 1867. Queen Street station after the 1884 enlargement. The station soon became a victim of its own success as the facilities were inadequate for the large numbers of passengers that were using it. 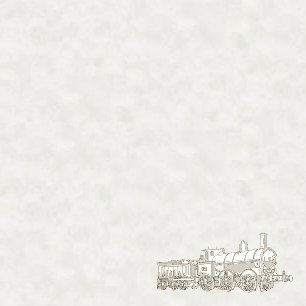 In the 1870's about 120 passenger trains and 50 goods trains called there daily. In 1876 the total number of passengers that used the station was 936,026. It got so bad that the town council complained about the lack of facilities. The main problems were a shared booking office and refreshment room, lack of waiting rooms on the up platform, low and narrow platforms, and a dismal subway which connected the platforms. The subway was so bad that it encouraged people to cross on the lines, and several were killed in the process. The London & North Western drew up plans for the station's improvement and included them in a Bill in 1876. This was successfully opposed by the Great Western because the new buildings would have been built across the public's approach road to the Low Level station. The plans for improvement were further delayed by the council's work in 1883 which involved a new direct approach road to the station. In 1884 the enlargement finally took place, and included the tunnel allowing public access from the High Level to the Low Level station, and the arcade known as the colonnades. Although the station saw the LMS grouping in 1923, and the formation of British Rail in 1948, nothing much changed until its demolition on 25 January 1965 as part of the electrification scheme. The original gateway building still survives having gained grade 2 listed status on 3rd February 1977. It was purchased by the town council in 1986 and work began on 17th May 1988 to restore and convert it to its present totally appropriate use as the entrance building for the bus station.